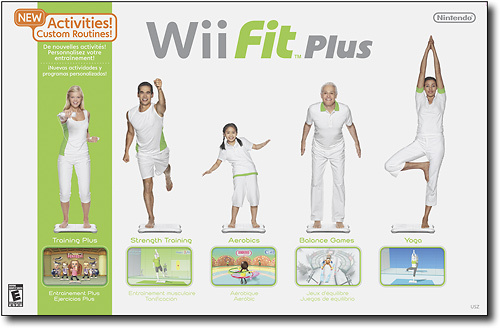 Sorry, we are currently sold out of 'Nintendo - Wii Fit Plus with Wii Balance Board for Nintendo Wii'. Building on the revolutionary Wii Fit, Wii Fit Plus with Wii Balance Board offers a variety of fun ways to start you down the path to a happier, healthier you. This exciting new fitness experience lets you shape your workout to your specifications with a multitude of customized routines, including the option to create your own personalized workout. With an array of new activities to choose from, Wii Fit Plus gives you even more choices for establishing an effective workout that will help you look and feel good. Wii Fit Plus lets you craft a routine suited to your personal fitness goals. Combine yoga and strength training exercises to create your own personalized routine, or select one of a variety of mini routines tailored to address specific fitness needs. Use the included Wii Balance Board to perform 15 new and exciting activities that will have you leaping from moving platforms, hitting golf balls and more. You can even track your stats and those for members of your household by monitoring your calories burned, your BMI and other figures, as well as the weight of your baby or family pet. Plus, with the new multiplayer mode, you can team up with a fitness buddy to enjoy the fun and benefits of a Wii Fit Plus workout together.